“Great is the Lord, and highly to be praised, and His greatness is unsearchable. The Lord never ceases to amaze me! I would like to tell you one story of His goodness in my life and how you can also be a part of it. In 2013, the Lord led me to begin studying for my associate’s degree in Early Childhood Education at Liberty University Online. Years earlier, when I finished high school, I got my GED and chose not to pursue higher education until such time as the Lord clearly called me to do so. At the age of 31, I assumed that would never happen. When it did happen, I started my studies with a determination that I would absolutely travel to Lynchburg, VA when I finished to enjoy what will likely be my only opportunity to walk for graduation. Six months ago, as I began to think about the fact that I would finish my studies in May 2016, I took a good look at the logistics of what a trip to Lynchburg would entail. Despite how much I wanted to be at my graduation, based on three major drawbacks, I decided to not make the trip. 1) Too expensive. While 2016 was a good time to make my next trip to the States, the cost of an additional flight to Virginia for a couple of days just didn’t seem worth it. 2) Bad timing. After my last trip to the States in 2014, I had determined that I would never travel while studying again. If I finished my studies in May, left for a trip to Virginia, then traveled to also visit Houston and Nashville to see family and friends, I would be gone for most of the summer – our busiest season in Ukraine. 3) Impractical. Thinking about it realistically, it seemed so frivolous to travel to Virginia in order to walk across a stage in front of thousands of strangers and not a single familiar face. The day after I decided I wouldn’t go, I got a message from a friend. She had heard through the grapevine of the possibility that I might go to my graduation, and if things worked out, she let me know she might be able to drive with me from Nashville to Virginia and attend my graduation with me. Suddenly, I didn’t know what to do. I decided I should at least look into it more. When I did so, I realized my classes actually end in March and then the graduation is in May, meaning I could leave after classes end and travel to see family and friends first, returning to Ukraine immediately after graduation and in time for the start of summer. I talked to my family about my confusion and when I mentioned walking in front of strangers just for the sake of walking, they all chimed in incredulously. They assumed I would have understood that they would each do anything possible so they could attend my graduation. In a matter of 24 hours, God had soundly countered every objection I had. It was still hard for me to accept, though. I continued to go back and forth for over a month, until one day, the lightbulb finally went off. This wasn’t a matter of what I deemed practical or impractical. This was a matter of my heavenly Father giving me a good gift! I was overcome that He would choose to bless me in this way – granting me the desire of my heart simply because He’s good. Somewhat apprehensively, I looked up what airfare might cost and almost fell off the chair when I saw a price the likes of which I don’t remember seeing in 20 years! Why? How? Why is God so good to me? In that moment, my mind was made up. I turned to my Father with open hands and accepted the gift He was offering with inexpressible gratitude. I am so very excited about this trip and looking forward to the opportunity of spending time with so many people close to my heart, of sharing with many people all that God is doing in our ministry here in Ukraine, and of walking that stage to receive my diploma. I don’t know exactly how things will work out with the trip. I don’t know if things will work out for me to drive from Nashville to Lynchburg or if I’ll have to fly. I don’t know if it will work out for any family or friends to be there or not. I don’t know how I will afford all of the other costs associated with the trip. But I know this is a door God has graciously opened for me and I trust He will provide for everything needed. To that end, I would ask if you might help with some of the costs of this trip. My goal is to raise $2700, but I would also like to bless you in return for any donation you make. 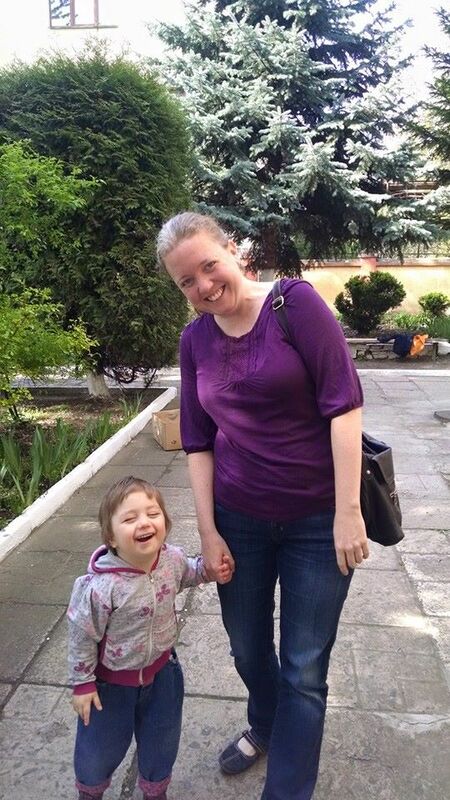 At this GoFundMe page, you can see some of the things I would like to bring to you from Ukraine. Thank you so much for any help you might give, and praise be to the God of abundant goodness! Spring semester for my studies at Liberty University Online is pretty much finished, and that means I get to put my full focus on ministry. I have been waiting for this day!!! I am thankful for the opportunity to further my education and sometimes even enjoy my studies, but even in the moments of enjoyment, I am frustrated at the time my studies take away from ministry. There have been days, when everyone was working hard around Bethel House and I was sitting in my room studying, that I contemplated throwing in the towel. Why should I be studying when there is so much work to be done?! The only answer I have is the only answer that could keep me from quitting – because I know this is something God wants me to do. So, I keep pressing on. And God graciously even allows me to see the benefits of my education by giving me opportunities to already use some of the things I’m learning in my ministry with the children at church. Despite the many ways God encourages me to persevere in my studies, I cannot contain my excitement that, for the next 3 months, I will be able to put my full focus on ministry. Today, I went to the orphanage with Maggie & Trey. I played, held, and walked with little kids that squeezed my neck and found rest in simply being held. Not once did I think about assignments that were waiting to be completed. After lunch, I helped Mom & Dad get our first seeds in the ground at Bethel House. We broke up the ground in half of the little garden that sits out front of our house and planted all of our herbs. The moment never came when I had to leave early to go study. Mom & I went straight from the garden into the kitchen, where we got dinner ready together. I was completely relaxed, enjoying the moment, free from the stress that I hadn’t spent a single moment throughout the day studying. Today, I gave my full time and energy to ministry, and it felt really good! Today was the first of many such days, as our summer is already jam packed with exciting and wonderful things to come. At the end of May, we’ll be having a youth retreat for our church out at Bethel House. In June, we’ll be welcoming guests who will come to help and celebrate with us as we participate in Franklin Graham’s Festival of Hope, and dedicate Bethel House. In July, we’ll welcome two World Race teams, who will serve with us as we continue in our regular ministries and focus on discipling and integrating new believers from the Festival of Hope into the church. 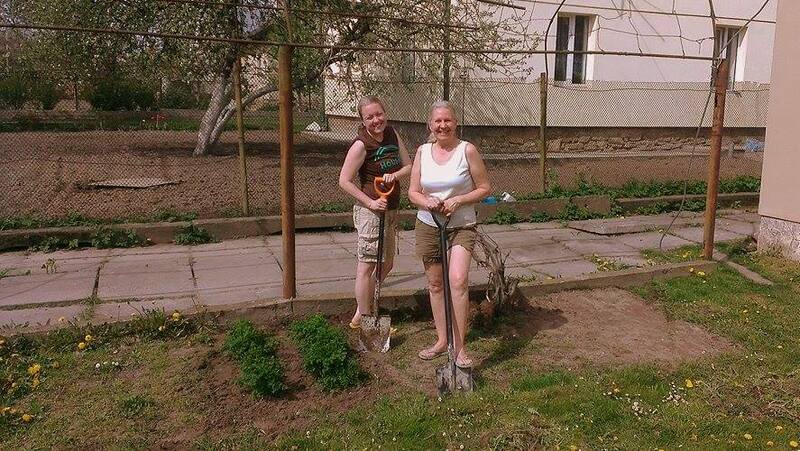 All the while, we’ll be gardening, working on completing Bethel House, continuing our ministry at Living Word Church, and enjoying the blessing of being a part of God’s amazing work in Ukraine at this time. What a blessing to serve Him in this nation, and what joy that I can do so wholeheartedly throughout this summer. The best is yet to come! . 15 months. That’s how long Ukraine has been suffering with violence, conflict, and war. People have fought to be brave and hold onto hope in these times. Hope in the government. Hope in the world. Hope in themselves. Hope that someday, somehow, someone can change what is happening. Yet, day after day, the battles continue, the death tolls rise, and things continue to get worse. Over the last 2 weeks, they got a lot worse. An already crippled economy plummeted. In the last year, we’ve seen the hryven (Ukrainian currency) to dollar exchange rate more than triple, from 8 hryven to the dollar to almost 30 hryven to the dollar (and much of that has happened over the last few weeks). In the course of a single day, it jumped to 38 hryven to the dollar, and then dropped back down to 28. As Ukrainians have watched all this, panic has ensued. Grocery stores are busy all day long, and staples, such as flour and sugar, are in demand. Prices are skyrocketing. In about a week’s time, gasoline went from 16 hryven/liter to 29 hryven/liter. Many imported items have doubled in price over the last couple of weeks. And now, shoulders start to slump, eyes look weary, and a nation of people are losing their hope. And yet…there is a place of hope. So strange to see empty shelves. 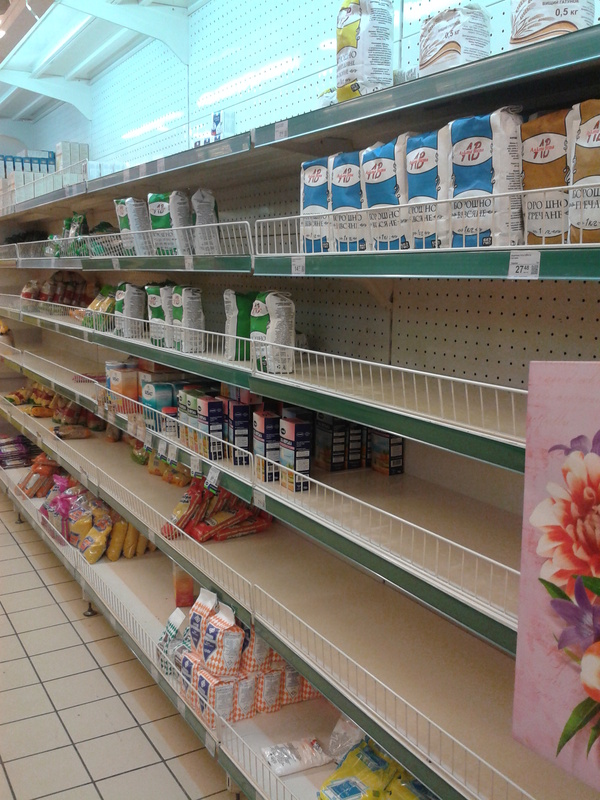 While overall, there is still plenty of food in the stores, this is not a sight we’re accustomed to seeing. There is a place where I forget how hopeless many in this country feel, because I see hope…in the Church. When I gather with Ukrainian believers, I don’t see hopelessness. I hear prayers for a country that is loved and is suffering, yet I see hope, joy, and light in the eyes of the people around me. Truly, the Lord is good, and His mercy endures forever! He is a strong Rock, and as everything crumbles around them, Ukrainian believers are finding that He is a sure foundation. Their hope is not lost, because their hope was never in the government, the world, or themselves – their hope is in Christ, and while everything around them has changed, He has not. Now, the real work for believers begins. 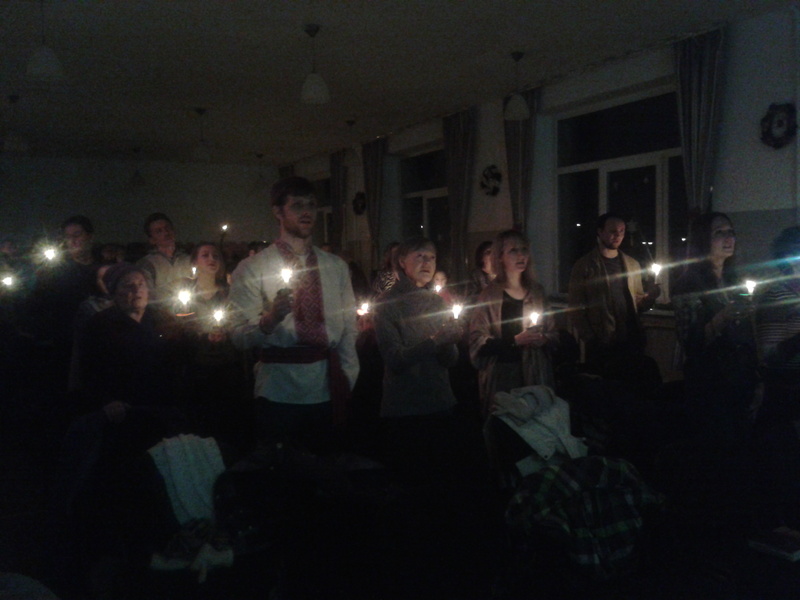 It is time, like never before, for the hope of Christ to be shared with people throughout Ukraine. This is one of those times where you see the big picture. You see God’s master plan coming together. He knows everything that will happen before it comes to be. Nothing in Ukraine has caught Him by surprise. He knew, that at this time, Ukrainian believers would need a way to reach multitudes of their countrymen with His hope. So, he led the Billy Graham Evangelistic Association to bring Franklin Graham’s Festival of Hope to Ukraine in 2015. It was initially going to be held in a city in eastern Ukraine. When the situation there destabilized, they chose not to back out of Ukraine, but to move the festival to Lviv – to our city. Since September of 2014, active preparations have been ongoing to get Ukrainian believers ready for this massive opportunity. Pastors are being engaged, equipped, and inspired. Believers are being encouraged to pray now for people they will invite, to organize transportation to bring groups from other cities and towns, to join a 2000-voice choir, to sign up on the hospitality team, to train as decision counselors, and to be trained and prepare to disciple new believers. Our church, Living Word, is seizing the opportunity and is actively involved in preparations for the festival, and for welcoming new believers after the festival. On June 20, 2015, Ukrainians will gather in a 35,000-seat stadium and hear the message of true hope that is only found in Christ. 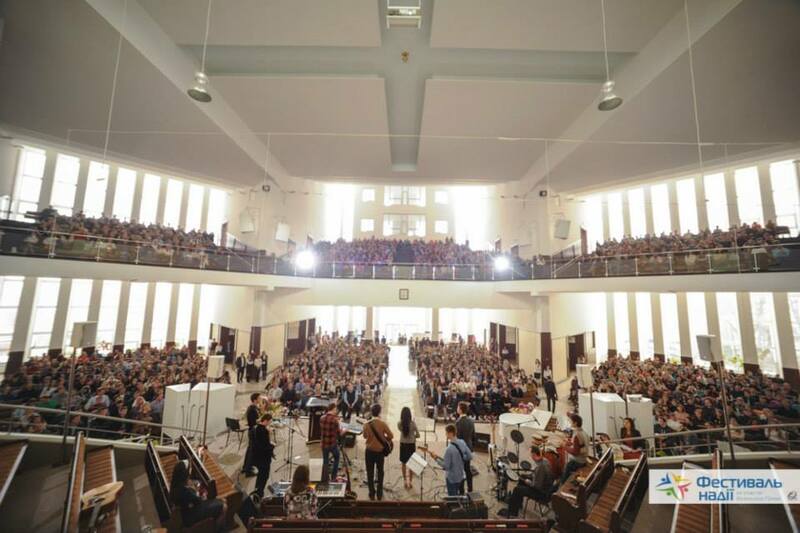 Feb. 2015 – 1500+ people attended a youth gathering meant to get young Christians excited and involved in the Festival of Hope. For our part, we know God has us here for such a time as this, and we don’t want to miss a single opportunity. All 3 of us will be as actively involved as possible with the Festival of Hope. At the request of the festival organizers, Bria wrote a song specifically for the festival and has been performing it at different festival events; she will also be performing at the festival. I will be serving as an English-language decision counselor. Krista will arrive back from Cyprus just in time to attend the festival, and serve in any way she can. Aside from the incredible opportunity the festival presents, we pray that we will be found faithful every day to share the hope found in Christ with those around us. This is the time – God is ready to pour out His love, His salvation, His hope on the nation of Ukraine. It is inspiring to see the Church in Ukraine rising up to be His hands and feet, and it is a joy and privilege to be here and serve with them. What a mighty, awesome, beautiful God we serve! It’s been a while since we’ve had a new post, and even longer since I, Krista, wrote anything. So, here’s an update on life in Ukraine. Please don’t stop praying! Ukraine lost nearly 100 heroes during the battles in Kyiv. Hopefully the worldwide news is reporting what is still happening. The biggest threat now is Russia. They have invaded Crimea (an autonomous republic that is part of Ukraine) and many feel it is lost to Ukraine, though war hasn’t officially happened yet and Ukraine is still claiming Crimea. It’s a very unstable situation and everyone is waiting, praying, and holding their breath. Russia is unpredictable and no one knows for sure what they are planning, but everyone knows they won’t give up without a fight. Militarily speaking, barring a miracle, Ukraine has no chance against Russia. The military is quite small and lacks weapons. Ukraine has begun conscripting all eligible males, and we personally have friends who have received summons to begin training as soon as they receive the order – guys who have no previous military background. There is a good chance a war is still ahead for Ukraine and they are beginning to prepare. So, please continue to pray with us! The east is still in unrest, many Ukrainians are being attacked by Russians, some have died, girls have been raped, and provocations from Russia are a daily occurrence. Pray for the Ukrainian people, pray for the men being called up and the families they leave behind, pray for miracles regarding Russia that they would turn back and leave, pray for peace, whatever God puts on your heart, and most of all pray this would bring about a spiritual revival as people turn to God and seek hope! (A brief side note: don’t worry, we are safe and far from the danger. Lviv is on the far western border of Ukraine, and Crimea is in the southeast.) Another way you can help, is to call your state representatives and ask them to do all they can to help Ukraine. In other news, ministry continues and is going well. Since last summer I have been leading our church Sunday School ministry. It’s been such a joy to see the kids memorizing scripture and enjoying church. We have seen a number of families that had stopped coming return to our church family, and sometimes they even admit that it’s the kids begging to come to church that brings them! We’ve just started back at the beginning of the Bible and are finishing up the story of creation. If you enjoy crafts with your kids or are in children’s ministry, be on the lookout for a creation craft blog post soon! In my search for crafts I ended up creating my own and would love to share it with you. Unfortunately, due to flu season in the city, the orphanage has been under quarantine for almost two months. We are all missing the kids and anxious to get back to them. We are hopeful we will be allowed to return tomorrow! Construction is in full swing again at home, about to kick into even higher gear as we prepare for our first World Race team of the year, in May. We need to quickly finish some rooms so as to be able to host them. The teams are always a huge blessing and we look forward to enjoying a new team soon! I am happy to report that I still get to talk with Mariya, the woman I wrote about in the blog “4:30 a.m. Wake Up Call”. I try to call occasionally to check on her and it is always a joy to hear her voice. It is sad to hear the pain in her voice whenever she brings up leaving her service to God, but a joy to be able to remind her that God is forgiving and still loves her. The love she has for Jesus is audible and so real when she talks about praying to Him. Please pray for her, that she would find and accept His forgiveness and peace – I believe she is saved, but there is so much more He wants to give her in their relationship. To end, I just want to say, THANK YOU! Thank you so much to each person who supports us financially, physically enabling us to be here and serve. Some days I am hit with a wave of overwhelming gratitude for the goodness of the Lord and for your generosity and support – I realize that without Him and without you, I wouldn’t be here…and I cannot even tell you what a gift each day here is. Thank you to everyone who has prayed and is praying for us, spiritually enabling us to be here. Prayer is as important of an aspect to life here as financial support, again, it takes both to be here. Thank you to everyone who has taken time to read our blogs, to share our blogs, and to send us an email of encouragement – we appreciate it all! This past Sunday, I had the joy of seeing my 5th grade Sunday School teachers, and the privilege of speaking at the church they pastor in Waller, Texas, Fellowship at Field Store. I was first introduced to Mr. & Mrs. Chivvis when they taught me for about half a year in 1992-1993. It was during my time in their class that our family first moved to Ukraine. They had a little farewell party in Sunday School my last week, and then I was gone. I never expected what followed. Regular letters, including photos, and even an occasional box of goodies would arrive in Ukraine from Mr. & Mrs. Chivvis. Knowing that I was not forgotten, hearing about what was going on in their lives, getting those special treats from the States – it all meant so much to me. Through the years, I have enjoyed seeing them every time I’m in the Houston area. This time, seeing them caused a lot of reflection on my part. I was struck that this couple, who isn’t related to me and didn’t even know me until I showed up in their class, has now been a part of my life for over 20 years, simply because they chose to go beyond (far beyond!) what they were responsible to do as Sunday School teachers, and invest in the life of a child God brought in their life. It made me pause and think about how I respond when God brings people in my life. When I know God is leading me to invest in someone’s life, do I do the bare minimum, try my best, or really give it my all and go far beyond anything that might be expected of me? 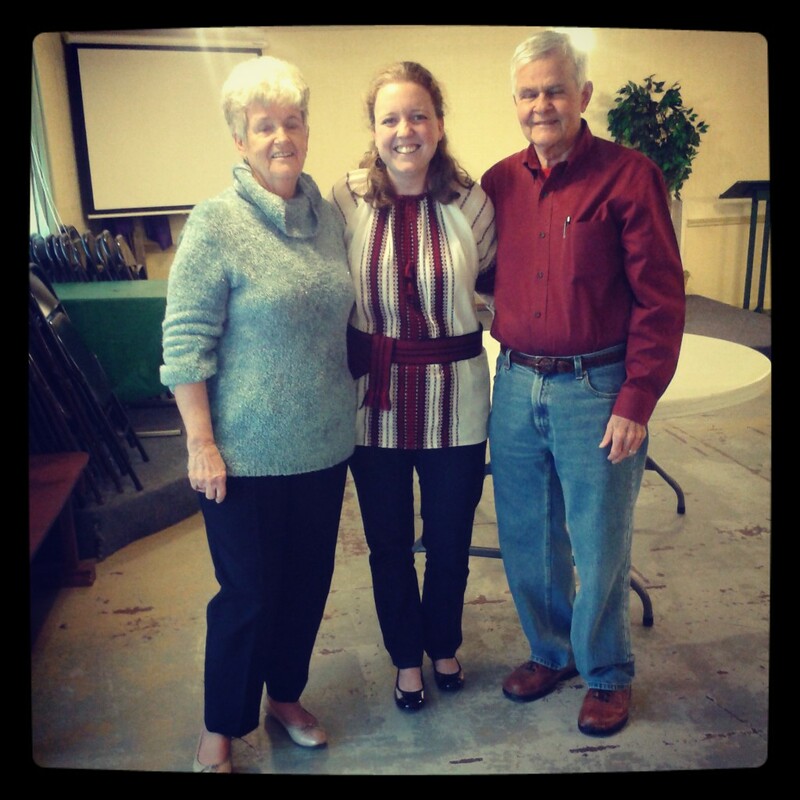 God has used Mr. & Mrs. Chivvis so greatly in my life, and they have often been a source of comfort and encouragement. Last Sunday, I was blessed to see, and hear about, the young people that they continue to invest in, as God brings them into their lives. Their example challenges and encourages me to go the extra mile in the relationships God brings into my life. I hope it does the same for you.